Now I know I’m not the only weird one that creates their tablescape a week in advance just to make sure it looks okay (please please tell me I’m not alone in this). There’s no pulling together at the last minute for me, I’m far too OCD for that rubbish. No, last weekend, I set the entire table and I didn’t have any company at all. Let’s call it a trial run. And plus, on Christmas day, if you think I’m going to entertain, cook AND take blog-worthy pictures, I hate to disappoint you. That’s so not gonna happen. So here it goes. My trial run. The vintage style tray that I had in my dressing room was called in for duty to house a bit of colour in the way of a poinsettia and a couple of white ceramic tealight holders I purchased when we visited Cheltenham earlier this year. 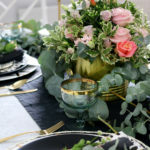 A little dash of blue is provided by mini baubles added to the base of gold dinner candles. The chairs were decked out with mini wreaths and tied with gold ribbon and a Christmas ornament that says ‘JINGLE’ with little bells. The tablecloth – which I absolutely LOVE – came from Zara Home. The pattern is subtly metallic, with just a hint of a sparkly sheen and reflects nicely under candle light. And little gold tree place holders were added, purchased from Next. As were the glass candle sticks which, like most of the items seen, I can use anytime. All the glasses on the table are vintage, purchased last year from eBay for a song. The little vintage brass elephants have made an appearance as well as I’ve been loving all the little gold animals on table settings this past year. 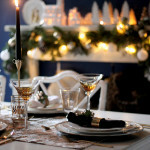 In fact, I like that the table doesn’t scream ‘Christmas’. Here’s an overhead shot of the whole shebang. The dinner plates were purchased from Zara Home as well. I so love their little bubble border in gold. The gold cutlery was purchased last year on eBay. 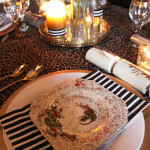 The gold-rimmed Christmas Tree plates were purchased in the sales last year. I’ve had the dappled gold chargers since around January. I love how the patterns all mingle quite nicely. And finally, here’s the room shot with everything lit up! Festive-a-rama! It looks nicer in the evening with the candles and fairy lights twinkling away on the mantle and bar cart. So that’s my Christmas tablescape! I do hope you like it! 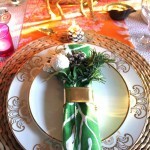 Are you planning a pretty tabletop for Christmas? There’s only a few days left until the big day – are you ready? Want to see last year’s table? You can see it here. So much eye candy! How can you even eat off that table?! Don&#39;t get it dirty please, it will stress me out. It&#39;s too pretty. I love the Xmas tree plates! Where did you get those?